The powerhouse of America’s economy — small business — is being sabotaged. Yes, sabotaged — not by taxes, but by our health care system. Small businesses are a huge sector of the California economy, representing more than 99 percent of all state businesses and providing jobs for 6.8 million, nearly half of all California’s private employees. Yet small businesses are among the most negatively impacted by our nation’s health care system’s runaway costs and corporate insurance system. Private businesses spent $637 billion on private health insurance in 2015 and are projected to spend more than $1 trillion by 2025. Healthcare costs represent more than 17 percent of U.S. GDP, significantly higher than any country in the world. In California, a solution is on the table now — the proposed Healthy California Act (Senate Bill 562) — which will be taken up again when the Legislature reconvenes in January. SB 562 provides superior benefits to businesses and households than those currently on offer, and will dramatically reduce expenses for small businesses. With Medicare-for-all, no company, individual or household would pay premiums, deductibles or co-pays — at all, and everyone is covered. Taxpayers would save money by lowering overall health expenditures (taxpayers already finance 70 percent of health care expenditures). By reducing administrative waste, eliminating marketing expenses and insurance company profits, negotiating payments and through other measures, we would actually reduce health spending by 18 percent. A financial analysis by the Political Economy Research Institute at the University of Massachusetts-Amherst found that SB 562 could save small businesses up to 22 percent on health care as a percent of payroll. As compelling as the financial figures are, other compelling benefits for small businesses deserve attention. Freeing businesses from the burden and expense of managing and paying for their employees’ health care will unleash them to invest in innovation, their employees and building their businesses. Small businesses could compete more effectively for employees drawn to larger employers because of health benefits. Would-be entrepreneurs would not have to hesitate about leaving their jobs to start a business for fear of losing health coverage. An article in Fortune magazine noted that small- and medium-sized businesses spend inordinate amounts of time, energy and resources trying to navigate an incredibly complex system to secure cost-effective coverage for employees. Employers often spend weeks every year negotiating with private insurance companies, filling out reams of paperwork and switching carriers to get the best deal. There’s also the stress of administering the plan, which creates risks and liabilities for the business. For example, failing to add a newly eligible plan participant such as a new employee, an employee’s spouse, adopted child or new baby can cause serious issues. Mistakes made in benefit plans can lead to costly lawsuits or to regulatory fines. The process of purchasing and maintaining complex and expensive employee health benefits can sometimes push small businesses to opt out of providing employee coverage. These decisions not only impact the business owners, but also their own families who lose access to attractive group health plans with lower premiums and deductibles like those available in the individual and family insurance market, as well as state exchanges like Covered California. Up until recently, the small business community has been silent in this debate. The Business Alliance for a Healthy California is changing that by organizing volunteers to educate small business owners about the benefits of SB 562. 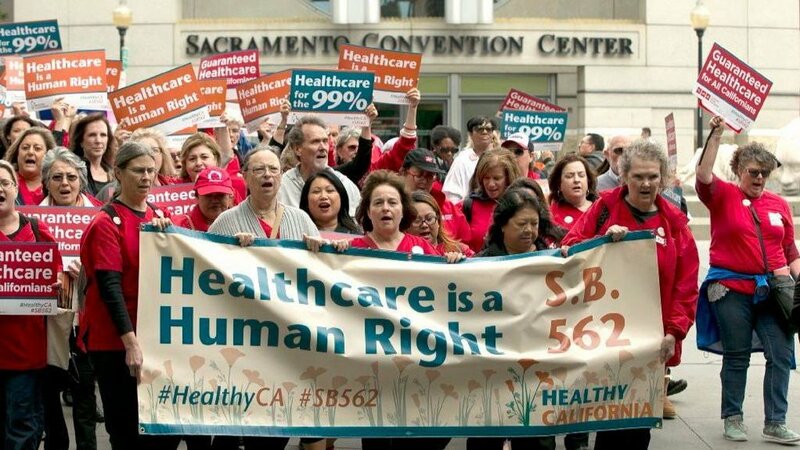 The “Another Business for a Healthy California” campaign is finding that many are not aware of SB 562 or are misinformed about its costs and benefits. However, once Medicare-for-all is demystified, many business owners become enthusiastic supporters. Let’s unleash entrepreneurship and free California businesses from the burden of our dysfunctional and outrageously expensive health care system. The voice of California’s business community must be heard! Leenson and Geiger are co-directors of the Business Alliance for a Healthy California. Website: www.ba4hcal.org.